Four civilians have been killed after Pakistani troops fired guns and shells at border posts in Indian-administered Kashmir, Indian officials say. Thirty others, including women and children, have been injured. Four civilians have been killed after Pakistani troops fired guns and shells at border posts in Indian-administered Kashmir, Indian officials say. Thirty others, including women and children, have been injured. Pakistan has not yet reacted to the reports. India and Pakistan have often accused each other of unprovoked firing along the disputed border. In August India cancelled talks with Pakistan after accusing it of interfering in its internal affairs. Last month Indian Prime Minister Narendra Modi, in his first speech at the UN, said he wanted peace talks with Pakistan but insisted it must create an “appropriate atmosphere”. Officials of India’s Border Security Force official said Pakistani soldiers fired guns and mortar shells at 10 of its border posts and some villages in the Arnia area on the Indian side over the weekend, leading to the deaths of civilians. They said India responded and the exchanges continued until early Monday morning. 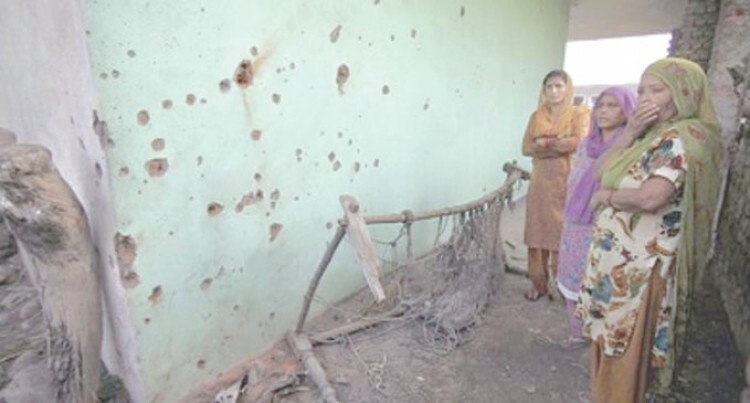 Separately, Pakistan has said Indian troops had resorted to “unprovoked firing” in the Jandroot-area of Pakistan-administered Kashmir on Sunday.